In an effort to strengthen maritime security, the 81st Immediate Support Vessels Squadron comprising seven Immediate Support Vessels (ISVs) were commissioned into the Indian Navy on Thursday. The ships were commissioned at Naval Dockyard, Mumbai by Sudhir Vasudeva, chairman and managing director ONGC, in the presence of senior naval officers and dignitaries from ONGC. A total of twenty three ISVs are planned to be commissioned in the Indian Navy. India's economic development is dependent on the seas and thus safeguarding the nation's maritime interests is extremely important. Our vital oil and gas installations located in the offshore provide almost 70% of India's indigenous hydrocarbon production and are valuable assets for energy security. The security of these national off shore assets of vital economic importance demands constant surveillance and credible response capability and swift reactions to emergent situations. 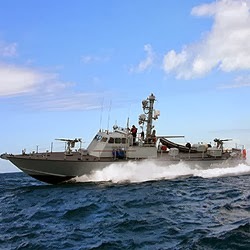 The ISVs are equipped with advanced navigational and communication equipment and armed with heavy and light machine guns. These vessels are designed to achieve speeds in excess of 40 knots (75 Km/hr) and can sustain themselves at sea for a considerable duration. Built ingenuously by M/S SHM Shipcare these vessels would be operated by the Indian Navy and would patrol the Offshore Oil Development Areas thus strengthening offshore security.